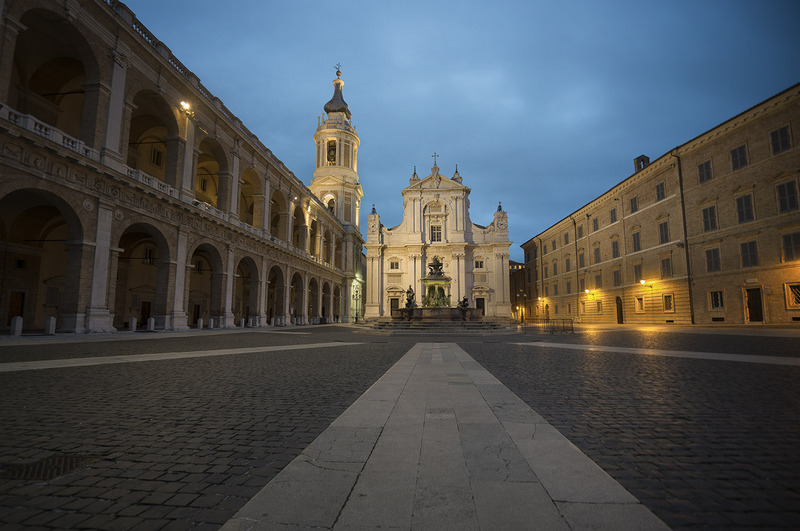 This is Loreto city – near Ancona in the east side of Italy. In Loreto the heart of the city is here, where is the Sanctuary with the famous Holy House inside and the Black Lady. At the side of the Sanctuary the art gallery of Loreto wich contains other works and treasures related to the Holy House. Loreto is a very small town and everything seems to revolve around this square and this impressive and beautiful Sanctuary, so it is very difficult to find the square clear of people and tourists. I must admit I was very lucky in this case, in the evening did two drops of rain, and many people have sought shelter from the square, luckily I was in the neighborhood and managed to photograph the in all its glory without people in the scene. All you see in this picture is the magic of the place, definitely a place of worship but also very charming from the architectural point of view.